It’s been a bad week or the AVN. Or should I say AVSN. You can hear the audio version of this report on The Skeptic Zone episode 282, here. 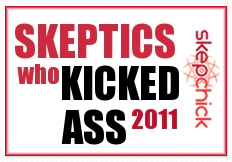 The AVN have a new name – The Australian Vaccine Skeptics-Network. This was officially introduced on March 7th, 2014 when it was approved by the Dept of Fair Trading. Initially, I was pretty annoyed at this, since I classify myself as a sceptic of the scientific-scepticism kind (not the loony 9/11 or climate change kind). However, it was clear to many of us following the findings from the name change challenge – where the magistrate defined the AVN as “sceptical of vaccines” – that the AVN would go after the word. This is in spite of Merpyl* having used it in a derogatory fashion for years, often shortening it to “septics” when referring to myself and my colleagues. At the same time however she had also decided that she was a “real sceptic” (she even set-up a blog called The Real Australian Skeptics” nyuk nyuk Marpyl*). Not “pseudo sceptics” as we were apparently deemed to be. So, after more than 12 months (it was Nov 2012 when the minister first ordered them to change their name) the AVN is now the AVSN. In reality, the public perception of the term “sceptic” is of climate change and moon landing sceptics – the term has definitely evolved to mean something other than scientific scepticism – so in actual fact it’s probably not a bad thing. However, in my (and others) opinions, it doesn’t go far enough. In an ideal world, I’d have liked to see The Anti-Vaccine Network, as this absolutely describes what they do, but we can’t have nice things all the time. 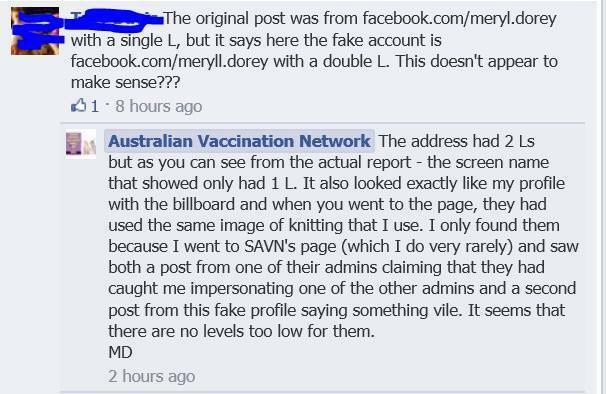 In a twist, Merl* is claiming she can maintain the acronym AVN and the URL avn.org because Vaccine-Skeptics is one word. Er, I dunno about this. Also of interest is that another person had registered the name Australian Vaccination Sceptics Network (note the “C” and lack of hyphen) several months before the AVN did. According to business law here in OZ, they have a right to challenge such a similar name. The AVSN smugness was short lived however, as the following day, the first draft of the shiny and new 2013 HCCC investigation into them was released. Readers may recall that the HCCC first investigated the AVN back in 2009 and this resulted in them issuing a public warning about the information on their website. The AVN successfully challenged the investigation (on a technicality) and thus the public warning was quashed and their charity licence re-instated. There must have been some very red faces in various government acronym that day. However, the government was determined not to give up, so the technicality that was the HCCC’s undoing was changed by legislation to include an amendment that enables the Commissioner to instigate investigations, even in the absence of public complaints (in this case, there were 2 complaints from the public and one from the Commissioner). Thus, almost as soon as the law was changed, the HCCC began a second investigation into the AVSN. The draft report released on Tuesday was published by the AVSN and they are now given an opportunity to respond to the Commission’s requests. Essentially, the HCCC trawled the AVSN’s website and selected 8 points that they identified as misleading, they then asked experts to provide evidence for why they were misleading. Their findings make for some good reading (and you can access the full pdf here) and are laden with “remove and keep permanently removed”. One wonders just how much stuff will remain on their site if they agree to co-operate with the HCCC on these points. The AVSN have also published several of their responses to the HCCC and as you can guess they’re chock-a-block filled with hubris, (as we’ve come to expect). If you can stand it, go have a look, they are now up to Part 6 of calling the HCCC incompetent and hopeless. This is not gonna end well. It seems to me very likely the AVN will not comply with the requests of the HCCC and it seems the HCCC also think this as they’ve already written the public warning (pdf) that will be released when the AVSN refuse to comply. I’m so very pleased to see this back after 3 years! (Just quietly, I think it’s better than the last one). Even more of a worry for a charity however, is that we can find no evidence of any monies going to charitable purposes. (In fact, in the entire time I’ve been observing the AVN I’ve never seen them do anything charitable). To cite a recent example, most recently, the AVSN were promoting a crowd sourcing campaign for a child who suffered a very rare vaccine reaction which rendered her blind. Her parents were raising money to build her a sensory garden, yet despite a monetary challenge from an SAVNer to match his $1000 donation, they never did donate to that cause (at least not as far as we know – and the campaign lists all the donors). This is despite her claiming publicly that “the AVN helps vaccine injured children and families everyday”. Despicable. “A chartered accountant who examined the documents for Fairfax Media, but declined to be named for fear he would be harassed, said the documents were ”the worst set of financial statements I have ever seen”. Heh, ”the worst set of financial statements I have ever seen”. See below for the evidence that the AV-SN have surrendered their license. Finally, the was much fun to be had on SAVN the last few days and one of our eagle eyed “likers” noticed Marly* had liked a post on a FB page with her secondary account, but signed it off as a particularly nasty vicious (previously anonymous) AVN admin, B52. (Full post here). This admin has been around for some time, and could be classified as the attack dog of the page, whereas Maryl* portrays the image of the “kindly Aunt”. See the image below. This was not the funniest part though, it was her backpedalling and lies to try to cover up her error that were the most hilarious. First she came onto SAVN claiming the account was not her and we had made it to impersonate her. She then went back to her aciolytes and declared we were “ebil septics” and could people please report the “fake account”. Only problem was, the account that posted as B52 has the url –meryl.dorey. The account she said we had made to impersonate her and had posted as B52 had the url –meryll.dorey. See the difference? So essentially, she got caught, decided to create a new account to pretend “ebil septics” but it backfired when even her followers spotted the different urls and questioned her. Oh a tangled web we weave. So it has been a busy week. But it’s also been packed full of lulz. And when that concerns the AVSN, it can’t be a bad thing. *Note: I have used various incarnations of the name of the ex-president of the AVN in this blog post – not out of disrespect – but because over the new year, she has a slew of people banned (some for weeks) on FB for “using her name without her permission”. Since I did not seek her permission, I have not used her name here.